were brothers who flourished in the early part of the sixteenth century, and distinguished themselves as men of letters. The place of their birth was Oderzo, a city of the Venetian territory. 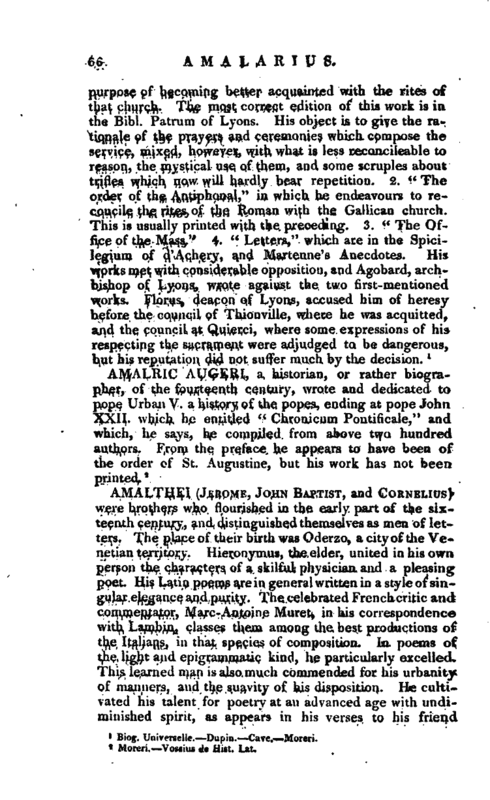 Hieronyrnus, the elder, united in his own person the characters of a skilful physician and a pleasing poet. His Latin poems are in general written in a style of singular elegance and purity. The celebrated French critic and commentator, Marc-Antoine Muret, in his correspondence with Lambin, classes them among the best productions of the Italians, in that species of composition. In poems of the light and epigrammatic kind, he particularly excelledThis learned man is also much commended for his urbanity of manners, and the suavity of his disposition. He cultivated his talent for poetry at an advanced age with undiminished spirit, as appears in his verses to his friend | Melchior, notwithstanding the complaint they breathe of decaying powers. He died at the place of his nativity, in 1574, in his sixty-eighth year. His fellow-citizens are said to have inscribed an epitaph on his tomb, in which they represent him as another Apollo, equally skilled in poesy and the healing art. His poems, together with those of his brothers, were first collected and published entire by Hieronymns Aleander, at Venice, in the year 1627, and afterwards by Graevius with those of Sannazarius at Amsterdam in 1689. 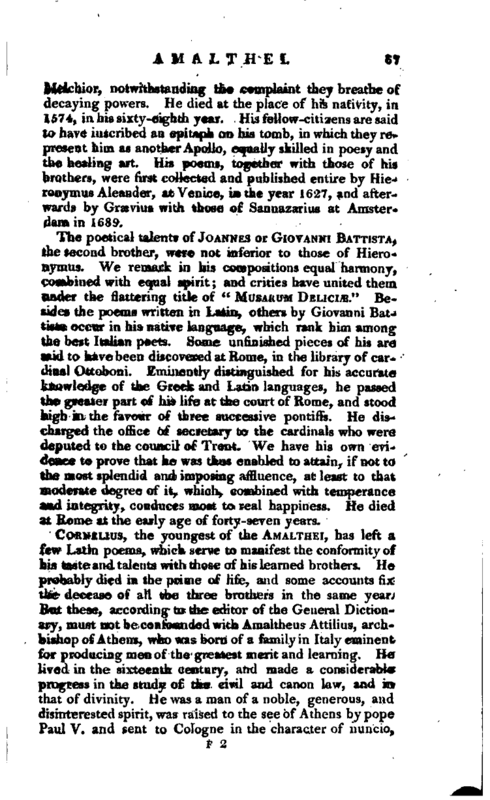 The poetical talents of Joannes or Giovanni Battista, the second brother, were not inferior to those of Hieronymus. We remark in his compositions equal harmony, combined with equal spirit; and critics have united them under the flattering title of “Musarum Deliciæ.” Besides the poems written in Latin, others by Giovanni Battista occur in his native language, which rank him among the best Italian poets. Some unfinished pieces of his are said to have been discovered at Rome, in the library of cardinal Ottoboni. Eminently distinguished for his accurate knowledge of the Greek and Latin languages, he passed the greater part of his life at the court of Rome, and stood high in the favour of three successive pontiffs. He discharged the office of secretary to the cardinals who were deputed to the council of Trent. We have his own evidence to prove that he was thus enabled to attain, if not to the most splendid and imposing affluence, at least to that moderate degree of it, which, combined with temperance and integrity, conduces most to real happiness. He died at Rome at the early age of forty-seven years.